The online hacker group Anonymous has claimed responsibility for a cyber attack on federal government websites, in protest against the recent passing of the government's anti-terror Bill C-51. A number of federal government websites appear to be back online after the brief blackout, including websites for the Senate, the Justice Department and Canada's spy agencies, CSEC and CSIS. However, it's unclear whether the attacks have stopped, as government websites seem to be flashing on and offline intermittently. 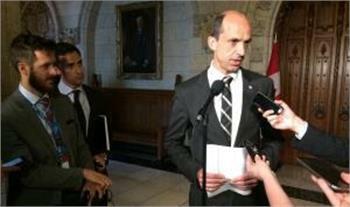 Public Safety Minister Steven Blaney said at no point was personal information or sensitive government compromised.